I don’t read a ton of teen fiction, but the book A Monster Calls was recommended to me, and I’m so glad that I gave it a try. This book was written by Patrick Ness, but the original idea came from Siobhan Dowd, who unfortunately died before she could write the novel. This book is about a young boy named Conor who is struggling with understanding and coming to terms with his mother’s illness. He is visited by a tree-like monster who demands that Conor tell him the truth. The writing style is hauntingly beautiful and feels almost like a parable or fairy tale. There is a timeless quality as it deals with universal emotion. 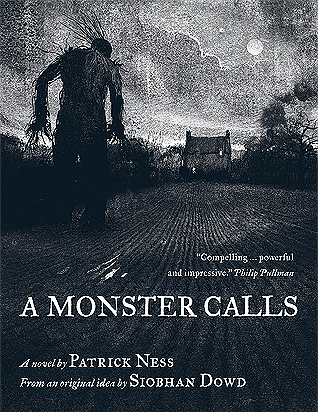 A Monster Calls is such a quick read, and I think it would be great for a high school English class. It deals with heavy themes like illness, divorce, death, and bullying. However, it is written in a very accessible and respectful way. There were no vulgar moments that I think might give parents pause. It is definitely age appropriate in my opinion. I don’t often enjoy movies that are based on books, especially if I loved the book, but I do think that I’d like to see this movie. I think that there could have been more description in the book, and I’d be excited to see how it plays out visually on screen. Overall, I think this was a great book that both teens and adults will be able to relate to. Definitely, give this one a try if you don’t mind crying a bit.